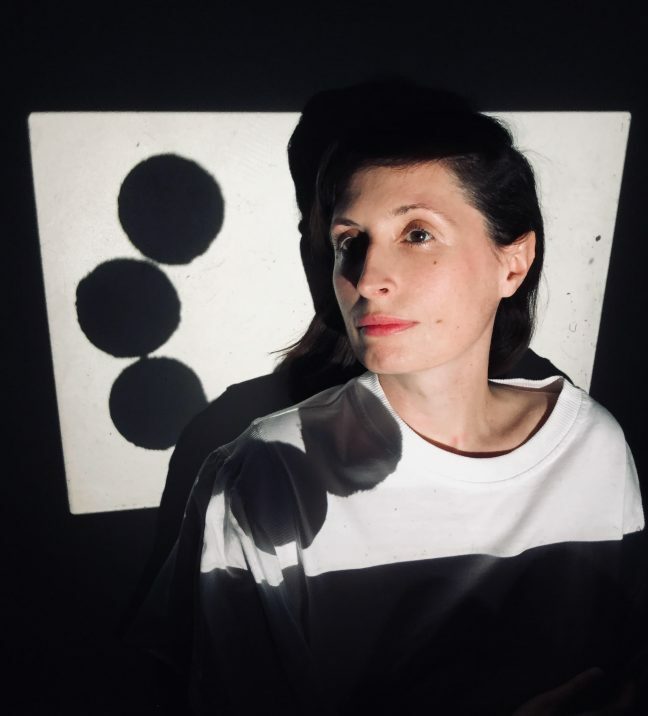 Olivia Louvel is a French-born, British composer, producer and artist whose work draws on voice, computer music and digital narrative. As with many of the DMSA students, Olivia has come to engage with sound, and eventually the course, through a unique pathway. She has produced a body of exiting and critically acclaimed projects and we are very happy to have her on the course, currently in her second year. DMSA: Three words that describe you as a creative person? OL: My initial artistic outlet was voice then theatre. Some time after I graduated from the National Conservatory of Dramatic Art but nothing was really happening for me as an actor (which in hindsight was probably for the best!) I began making some weird sound objects on a mini-disc with voice and found sound objects, it was very fragile, I didn’t have yet access to a laptop. Then I finally got an iBook and with an Mbox I could run Pro-Tools and that was it, the liberation! My liberation of sounds. DMSA: In what ways has the DMSA course supported or helped you to develop into who you are today creatively and professionally? OL: The DMSA course is helping me fill in some theory gaps and contextualise my practise. Being self-taught, I am joining the dots and it’s wonderful to learn to articulate my thoughts, talk, write an essay. It’s a laboratory for ideas, experiments and exchange. It is a privileged moment and I’m enjoying every aspect of it. Last year, I had the opportunity to compose a piece for multi diffusion channels, this was exhilarating. I also took part in a DMSA collaboration with the Brighton Youth Orchestra, supervised by senior lecturer Jean Martin. Along with two of my fellow students, Sonny Bacon and Luke Vosper, we had the opportunity to perform with the BYO at the Brighton Festival, it was a wonderful challenging experience. Throughout the course, I also stepped into the world of Pure Data, Max/MSP which opened new avenues of experimentation for me. There were certain projects last year which I am now planning to develop further into a new composition. DMSA: Can you tell us a few words about your ACE-funded project ‘Data Regina’? OL: Data Regina is inspired by the reigns of two queens/ rulers of the 16th century, Mary Queen of Scots and Elizabeth I. I was drawn to the life and writings of Mary Queen of Scots, a poet and essayist herself and one of the most read woman of her time. What surprised me the most is that we know very little about that creative aspect of her life. She documented her turmoil, her captivity (19 years) through writings. The last sonnet she wrote ‘Feb.8 1587’ was on the morning of her execution. I’ve assembled a digital narrative through songs and ‘battles’ which are instrumental tracks inspired by the 16th century battles on the Anglo-Scottish border. As well as the publication of a CD, there is a dedicated online platform www.dataregina.com to showcase the 3D animations produced by young animator Antoine Kendall as well as curated historical references. I am very grateful for the Grant for the Arts received from the Arts Council. DMSA: What are your plans for the near future? projects, events, visions? Dave Osborne is Puncture Kit…a live drummer and electronic composer. 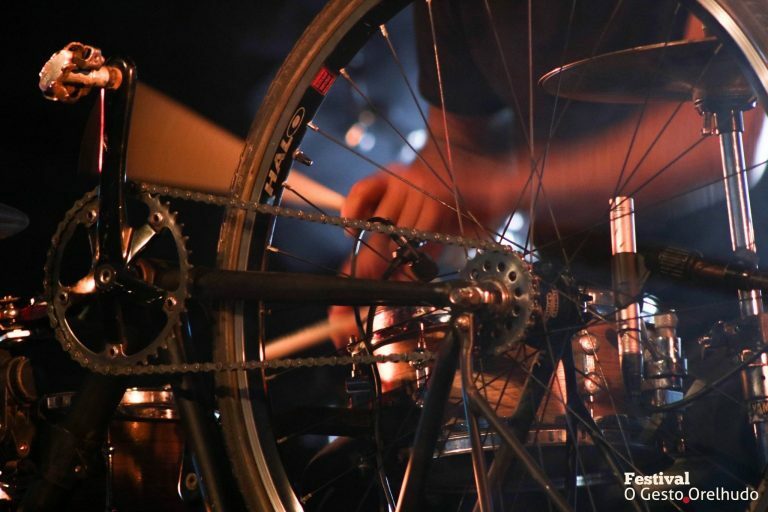 His bicycle is his transport and drum kit and on 27th November, he’ll be setting up in the Performance Studio to give you a live demo. You are invited to submit a work to be used in the session. Please send your compositions/field recordings and loops to m.e.papadomanolaki@brighton.ac.uk by no later than 23/11/17. Dave has performed for the Brits, Glastonbury, The Tour de France and many other events throughout the world. He loves the outdoors and is also regularly seen performing in the streets both here in Brighton and in London. For the DMSA demo, he has recently written a bunch of new electronic music…weaving in and out between many different time signatures and tempos…he loves the challenge of making sometimes complex timings sound danceable! 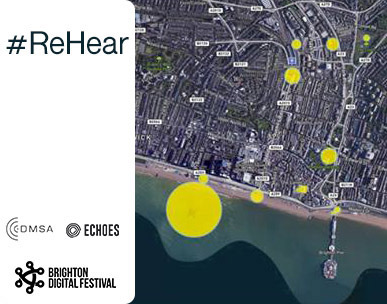 As an extra experimental side to the performance, Dave will be using abelton to trigger an array of sounds/ effects whilst improvising with his live beats. From electronic artists to visual programmers, we’re bridging experimentallism with the knocks of the UK soundsystem. With an eclectic line-up of artists and DJ’s, it is an honour to showcase such innovative music from digitally-oriented creatives. If you’re a fan of Warp Records to the more contemporary works of Ryoji Ikeda, Tim Hecker or Alva Noto – then this is not one to miss. 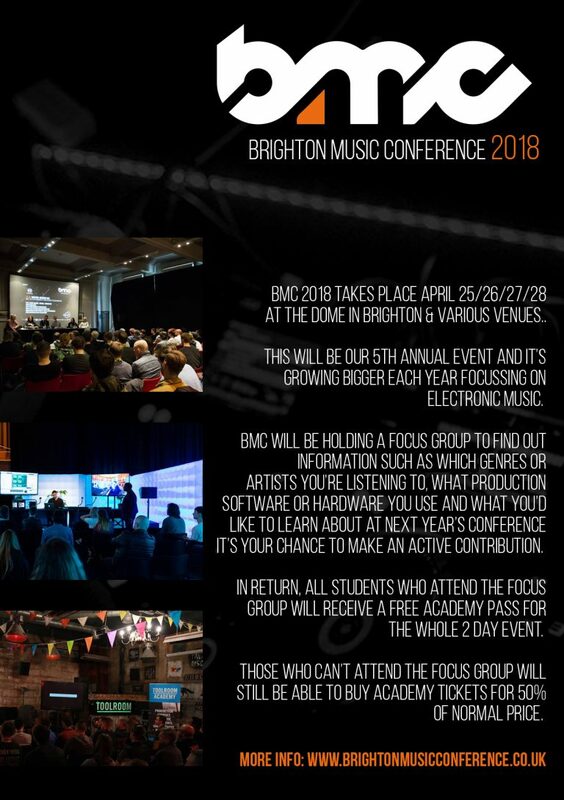 DMSA students will have the chance to participate in a focus group led by Seamus Haji of Brighton Music Conference committee and get in exchange a free pass to this year’s edition of the Conference. More info below. The focus group is scheduled for Monday 13th November, 5:30-8pm at Performance Studio, Grand Parade. 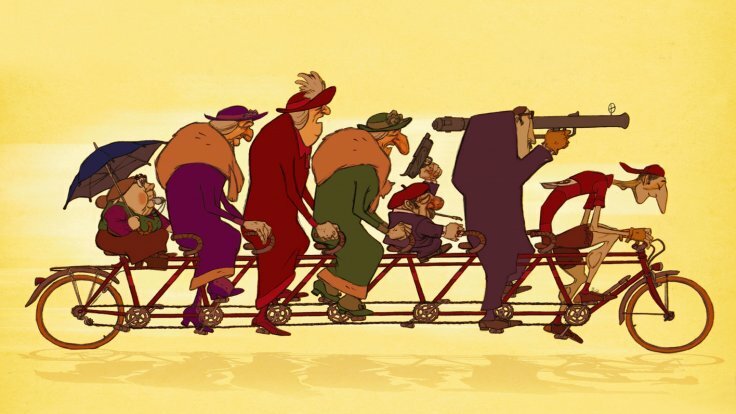 A wonderful animation film with beautiful sound design and no dialogue (a mute film).